I didn’t know Heinz Geidel too much, though his wife Trish is a good friend of mine even before the days of The Whiskers’ Syndicate. Those days, I used to write on behalf of many charities and various animal cruelty causes. I didn’t remember how it began. It’s just that as far as I remember, we’re friends. She is the cheerful one, I am the gloomy doom. She jokes a lot, I am angry too much. When I slowly shifted from writing for others to writing for my own rescues, I remembered Trish to be the first who fawn all over the story. And then I learned, with a course of time, that she has a soft spot for Siamese (or Ragdoll, or Tonkinese, or Himalaya, anything that has big silly blotch in the middle of their faces), though she loves all cats just as much. The more we wrote each other, the more we know each other. I think of Trish as my mother, she thinks of me as her daughter. In between those mother-daughter moments, Heinz weaved in, and soon him too become the father figure that ease a little of the pain of losing my own. My own dad loves teddy bear, Heinz loves the owls. I don’t know what his favorite color is, because he never told me, nor answered when I asked, but he wore black a lot. Heinz was way different. He likes orange. As of late, however, six months past, maybe a year, aside from Diabetes, cancer grew in my daddy Heinz’ kidney. It went undetected for a very long time until it’s too late. Obviously, everyone do what they could. I loathe myself that all I can do is pray and look for natural alternative medicine, those that helped healed many in Asia. Still, at long last, my daddy Heinz went away. 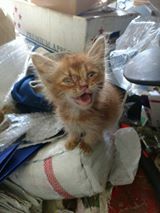 That morning, last week, I passed straight to the sight of a very dirty, very skinny, and obviously sick kitten, sitting by the foot of a man, chatting with others. It took time for the bus to stop. First due to size and the other is the corner it was driving toward. But walking all the way back, I found him still there. Looking up with eyes lit by the hope that start to dim. Even between the chatter, even between the laughter, there’s no brief second that they look upon him and notice his silent plea. It was just a little life that he asked for. It was such a big ignorance that fell upon him. I crossed that deadly busy street in a hurry, and sweep him off onto my bosom. The two men reacted, and so was the woman who sell food just nearby, but the little kitten did not exist for them, so their presence does not worth it for me. He was too weak to meow, he was too weak to drink. He was too weak for food, he was too weak to keep living. He got panleukopenia, and he got amoeba. He got tape worm, he got fleas, and he got ear mite. He lives undetected until it’s too late. It was the sign and the answer I have been looking for. Everyone said I was excessive; everyone said I should just let him go. But he got three antibiotics interchangeably throughout the day. He got anti diarrhea, He got manuka honey worth nearly one million IDR and people think I am crazy to feed such delicacy to a sure-to-die street cat. Whatever I do, I do it for my Daddy. My Daddy Heinz who never give up. My Daddy Heinz who stayed steadfast in his faith. My Daddy Heinz who acknowledge the power of God in each and everyone of his way. And for those, God had made his path straight. And slowly the kitten start to meow. And slowly the kitten start to lick; and slowly he drinks by himself. Slowly he didn’t have to scream in pain because his rear hurts though his waste was liquid. Slowly that liquid waste start to form. Slowly, his fever went down. Slowly, he jumped down from the bed on his own. Slowly he walked straight. Yesterday, on my Daddy Heinz’ funeral, the little fur ball followed me into my studio. He climbed like a pro and walked across the table, toward the window sill. His standing fur glow in the sunlight. He looked at me showing him the paper I pulled out from an envelope I received the night before. Mummy Trish, as I said, the post today is for Daddy, and for you. I am sorry I can’t finish it on time, but here it is none the less. There is nothing such as coincidence in this world, everything happened for a reason, and is in place at certain timing for a purpose. Daddy had sent this little orange boy to me as a remembrance of his faith, I’d be honored if you named him in Daddy’s memory.